The purpose of advertising is to make your target market feel a certain way about your product or service. Whether you’re a small business just getting started, or a well-established business such as Coca-Cola informing you they’re still around after many years. For a business to be successful at one time or another they must influence their target market that the value of their services or products are worthy. Successful advertising will inform your customers of a new innovative product or service. Advertising is used to reinforce any benefits of existing products or services. If your business is not communicating effectively to your target market then your competitors may very much do so. By consistently promoting your products or services to your target market you are establishing effective brand recognition for your target market. Advertising is also for letting people know why you are different from your competition. If effective your advertising efforts will convince them that your product or service will give them benefits which your competitions product won’t. Advertising has been around for as long as there’s been things to sell, but modern marketing companies have combined some well-designed tactics to not only make us feel like we need something, but to make it seem like we came to that decision ourselves. None of them are overly complicated, but they are effective psychological tools. Promotions are almost impossible to escape. Everyone knows about commercials, billboards, and print ads, but advertising has evolved with media. Online advertising has become necessary and people have even started using Facebook to promote. In today’s commercial environment avoiding ads is much easier done and because there is so much advertising people have subconsciously developed the ability to block out unwanted information. Some companies are now trying to be unique with their advertising methods in an attempt to capture the attention of their target market. There are as many ways to get a message to the masses as there are products, but here are few of the more effective and sneaky. Product Placement, this is when a company puts a product into a movie or TV show. For example during a T.V show a character drinks from a can that is obviously a Coke. Subliminal Advertising, this one’s tricky. Subliminal advertising happens when an image pops up for a split second and we the audience has only notice it on a subconscious level, then wonder why we’re craving Jiffy Pop. Street Advertising, this is when companies use an ad’s environment to their advantage. Ads can be seen in subway tunnels, visible only to the riders, as well as advertising on pavement and with graffiti. Besides coming up with the actual products and services to sell. Marketing them is the next most crucial thing a company will do, otherwise, no one will even know about the existence of them. Some companies, like Coke, whom everyone in the world knows about, still spend billions of dollars on marketing. The reason is to keep their name out there and on the minds of their consumers. In both instances, advertising is the connection between consumer and manufacturer and is absolutely critical for the success of any business. 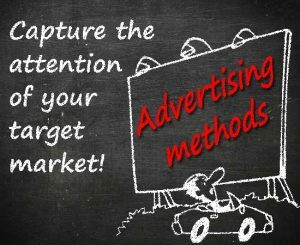 Before your next advertising campaign contact DLM Marketing for advice. DLM Marketing will help you create and manage effective marketing and advertising strategies regardless on the size of your marketing budget.